Although sales for diet pills are down, they're still a major money maker for stores like GNC. The retailer that sells health and nutrition-related products has a list of best-selling items, including the top diet pills. While this list may seem like a good place to start when searching for a little extra something to help lose those unwanted pounds, the pills may lighten the customer's wallet more than they do the customer. Before purchasing any diet pills from any store, consult a doctor to discuss benefits and risks. GNC offers a number of products under its own name, including the weight-loss supplement from the Total Lean line called Burn 60. The makers of the pill claim it increases calorie burning by as much as 60 percent. It contains extracts of guarana seed, black tea, grape seed and skin and ginger root. Guarana is a caffeine-containing herb found in a number of different diet pills; as a diuretic, it helps people lose water weight, not fat weight. And while the caffeine offers a boost in energy, it doesn't do much to help people lose weight, according to the Obesity Action Coalition. The makers of BioGenetics Laboratories HCG Activator, available from GNC, claim people can lose up to 30 pounds in one month while taking the supplement. It contains human chorionic gonadotropin glycopeptide stimulating complex, along with the amino acids tyrosine and ornithine. Human chorionic gonadotropin, or hCG, is a hormone found only in women during pregnancy. There are claims that the hormone also helps the body burn large amounts of fat, but there's no evidence that the hormone helps anyone lose weight or burn fat, according to the Hormone Health Network. The dangerously low 500-calorie diet that's recommended when people take the hormone supplement is most likely the part of the diet plan that helps them lose weight. 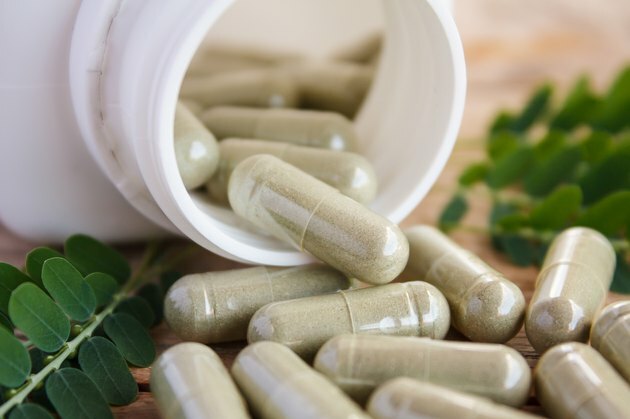 Generix Laboratories has created a weight-loss pill, sold at GNC, using a variety of herbs, including yerba mate, damiana leaf, chlorella algae, blue green algae, guarana and cayenne. According to the makers of BiphedAdrene, these herbs provide an energy boost similar to the banned prescription weight-loss drug known as fen-phen and the illegal herbal stimulant ephedra. Yerba mate is like caffeine in that it stimulates the nervous system to increase energy levels. While it's found in a number of weight-loss pills, it has not been proved to be effective at helping anyone lose weight, according to the Cleveland Clinic. Cayenne has thermogenic properties and may help decrease appetite, but the effects on weight loss are small. Diet pills may help a person lose some weight, but the weight loss won't last, according to the Cleveland Clinic. These types of pills may also be dangerous to human health. Guarana has been known to increase blood pressure and cause side effects such as nausea, dizziness or anxiety. Yerba mate taken for long periods of time or in large amounts may increase a person's risk of mouth, esophageal or lung cancer. As a protein, hCG is broken down in the stomach when taken as a pill, which inactivates any of the effects the supplement may have on the body. The only safe and effective way to lose those unwanted pounds is to create a negative calorie balance by eating less and moving more. Does Hydroxycut Work and Is It Safe to Take?